Despite my recent rant about the commercial excesses of Christmas and other festivals these days, I was pleased to see this report in The Daily Telegraph today. 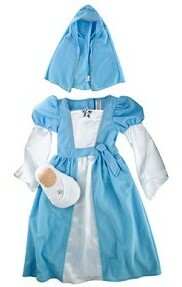 Yes, it’s sad that mums no longer have the time or the skill to make their children’s nativity play costumes. Yes, I think the last minute panic, the mis-matched amateurish costumes and the bald, bedraggled baby dolls were a shared cultural memory the loss of which is sad. And yes, I’m slightly cynical about Tesco et al finding another way to cash in on the Gift given to us at Christmas. But I’m also really encouraged. This tells me that the nativity play is still alive and well across the country, despite media scare stories of schools and councils banning any whiff of Christianity. As with the increase in availability of Christmas cards showing nativity scenes, it tells me that there are still plenty of people seeking to remember the true meaning of Christmas. And since it seems unlikely that we’re going to convince Tesco to stop selling ghost, ghoul and skeleton costumes at Halloween, it is great that at least they are providing ‘Christian’ costumes at Christmas.